Unable to locate your driver? Check in for your Denver Limo with the Taxi-Limo Attendant on Island One. Meet your Vail Transportation and Vail Limo driver at the Eagle Vail Airport holding a sign that says Eagle Vail Express at the west end of the baggage claim area. Skycaps and porters are also available to help with your luggage at the Eagle Vail Airport. 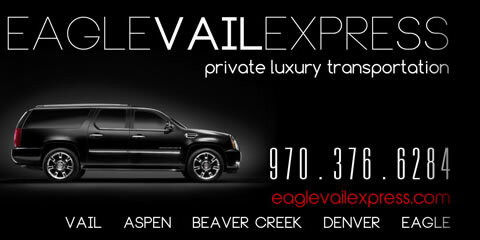 It is approximately a 30 minute drive to Beaver Creek and a 40 minute drive to Vail, Colorado.